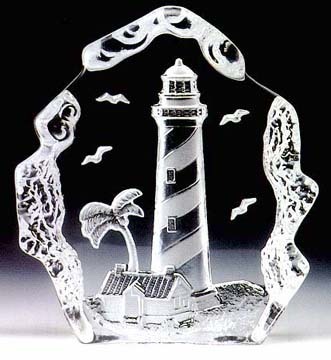 This beautiful Lighthouse Leaded Crystal Sculpture is intricately detailed and distinctive to add beauty to your home or office. It is sure to be treasured and adored by all. This leaded crystal sculpture will be a striking addition to any home. It also makes a perfect cake topper! 5.5" W. x 6.25" H.